The origin of Purdue's official colors goes back to 1887 -- just 13 years after the University began offering classes. The decision to adopt Old Gold and Black is attributed to the captain of Purdue's first football team, John Breckenridge Burris. Also, according to at least one source, the designation was rather hasty, says David Hovde, associate professor of library science. 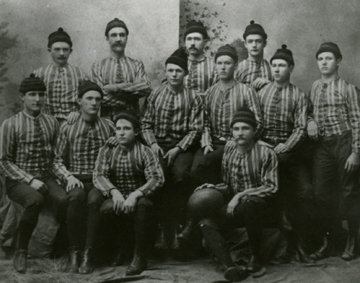 In fall 1887, the University's first football team had practiced together for about a week before it was scheduled to face Butler University's team in Indianapolis on Thanksgiving Day. The day before the game, the team members realized that Purdue did not have distinctive colors. A self-appointed committee of students and faculty swiftly met in University Hall to debate the matter, Hovde says. Burris, who admired Princeton University's athletic success -- its football team was the most successful in the country at the time -- suggested using that school's colors, which were orange and black. Not everyone on the committee, however, supported that choice. Several members wanted Purdue's colors to be distinctive, and so after some discussion, the group selected Old Gold and Black. According to the 1914 Debris yearbook, the decision to adopt Old Gold and Black was made in three minutes. As for Burris, he continued to make his mark on Purdue during his time at the University. In addition to being an editor of The Purdue, which was the student newspaper that preceded The Exponent, Burris was a founding member of the student Athletic Association. This student organization is the foundation of all Purdue sports. Burris later served as an agriculture lecturer at Purdue for 14 years. He died on Dec. 5, 1936, and is buried in Cloverdale Cemetery in Cloverdale.